My name is on the ticket!!! 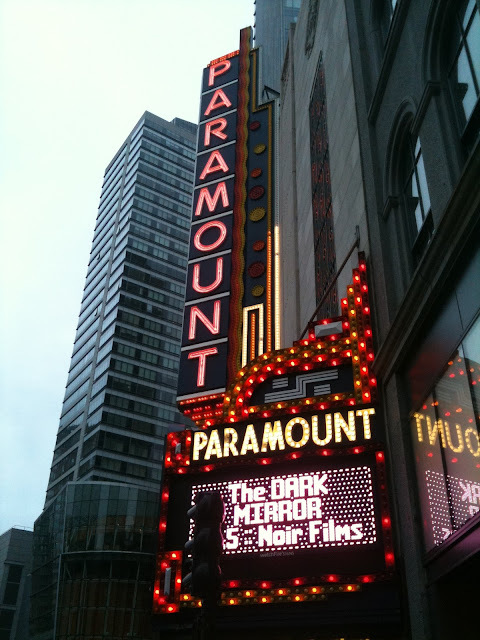 I was recently invited by ArtsEmerson to attend one of the Noir Nights screenings being shown at the Paramount Theatre. While I wish I could have seen them all, but I only had time to catch Beyond a Reasonable Doubt (1956). Although it is the only film in the series that was available on DVD (through Warner Archive), they did show a rare print and it was great to watch it on the big(gish) screen. The film was shown in the Bright Family Screening room which is part of the Paramount Theater building . While I was hoping to see a film in the grand 1,700 seat theater, I realize that the screening rare noir won't fill up a space that large. In fact, about 35-40 people attending this particular screening. However, I was very, very happy for any excuse to be inside the great Paramount Theater! Now most currently active classic film bloggers are too new to the blogosphere to remember Ginger (of Asleep in New York) and her scathing and spoiler-ridden review of Beyond a Reasonable Doubt (1956). I remembered it though. At least I remembered it was scathing. That's pretty much all I remembered because when I went to the screening of the film I had absolutely no idea what it was about. Just that Ginger didn't like it. And you know what, coming to a film almost completely ignorant makes for a very interesting experience. Carlos, who came with me to the screening, had seen the 2009 remake of the same name and knew the plot and most importantly the major twist. So he was expecting what I wasn't. Beyond a Reasonable Doubt is Fritz Lang's last American film and stars Dana Andrews and some chick named Joan Fontaine. Dana Andrews is Tom Garrett, a writer who just had a lot of success with his first published book and is struggling to write the second. He's in a relationship with Susan Spencer (Joan Fontaine), the daughter of newspaper magnate Austin Spencer (Sidney Blackmer). Austin Spencer is against capital punishment and is out to prove to District Attorney Roy Thompson (Phillip Bourneuf) that circumstantial evidence could bring an innocent man to the electric chair. When a burlesque dancer is murdered, Spencer recruits Garrett to pretend that Garrett is the murderer. They place fake evidence in various places all the while taking pictures and records of the acts to prove later that Garrett is innocent and that the evidence led prosecutors to the wrong man. Garrett even ingratiates himself with the two burlesque dancers who were the last to see the murdered woman alive. Garrett goes on trial. Then, as I like to say, things get complicated. 1956 is pretty late for the film noir era. I believe by that point audiences were so used to film noir fare that they were hungry for something new and different. Well Fritz Lang gave them what they asked for with this noir. The film has two major twists. It's those twists that make you either love the film or hate it. Most folks hate it. While I didn't love it, I didn't hate it either. I'm somewhere in the middle. Without providing too many spoilers, I agree with Ginger that the twists make the whole plot implausible. The major flaw is that there is no indication in the beginning of the film about what is to happen at the end. If there were, it would have saved the film for sure. Rebecca Myers from ArtsEmerson introduced the film and read to us from a quote which asked people to watch the film twice (unfortunately I forget the exact quote). I'm curious enough to watch the film a second time in case I missed something the first. However, overall I enjoyed the film. It kept me on the edge of my seat the entire time wondering what was going to happen next. Joan Fontaine was just blah. This is not her film. This is Dana Andrews film. And don't you forget it! Thank you to ArtsEmerson for giving me the opportunity to check out the Noir Nights program! I enjoyed this screening and hope to be back soon. Looks like a fun evening at the movies! I just recently got the remastered Warner Archive print during their Memorial Day sale. I know I read Ginger's review but like you I don't remember much now (grin) so the plot twists will be as new to me as they were to you! Thanks for a very enjoyable preview. Raquelle, just stopping by for a quick note to apologize for not being around lately to keep up with your wonderful blog. Things are easing up, and I'll be back! I liked Beyond a Reasonable Doubt, although I do agree with you that if there had been some indication at the beginning about what was to happen at the end it would have been much, much better. BTW, here's a link to the Paramount in Abilene, Texas in all its Art Deco glory. It is my favourite theatre of all time besides my beloved Kennedy in Kirksville (now gone due to a stupid bank needing a parking lot).